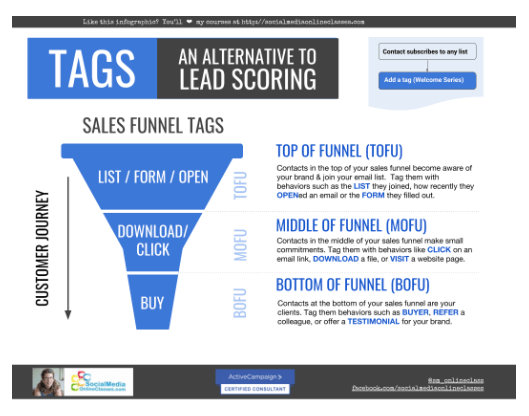 The further a lead traveled in my sales funnel, the higher the score they earned. …found the results lacking. All I saw was a number. That data didn’t tell me why they had that particular lead score. For me, lead scoring lacked relational context. What did my subscriber do to earn that score? Download 30 lead magnets or visit my pricing page? Click a link in an email or reply to it? I’m also a visual person — I need to see something other than a number telling me what actions my subscribers take to travel down my sales funnel. My ultimate goal was to paint a visual picture of where my subscribers were in the customer journey – who was just starting out vs. who was close to becoming a customer. Instead of lead scoring, I used an ActiveCampaign feature hiding in plain sight: tags. I created automations to assign tags to contacts based on their behavior and ActiveCampaign immediately painted that visual picture I was looking for. When I was using lead scoring, a subscriber who was engaged, but not a buyer would get an average lead score of 15. A subscriber who was engaged AND a buyer would get a lead score of 35. What was missing for me was the why: what actions did the buyer take the non-buyer didn’t? And what can I learn from that? I used tags to tell that story. Those tags may look like Greek to you, but to me they tell the story of one subscriber who purchased the same day she joined my list, while the other did not. What list did they join? What form did they fill out on my website? Did they actually open my welcome and follow up emails? What lead magnet form did they fill out? Sure, I could look at an individual subscriber record to see that; but I wanted to see that data at scale. You can create tags to tell your subscribers’ unique stories. A Middle of the Funnel subscriber (MOFU) might get a score of 25: now they’re consuming the lead magnet they opted in for, and possibly opening an email and/or clicking on it. But which lead magnet was that? Download FB Infographic tells me the subscriber clicked on a link to download an infographic on Facebook marketing. This subscriber is getting much closer to becoming a buyer, as they’re more engaged. She didn’t just opt in, she’s clicking on a link in my email to download my content. A Bottom of the Funnel subscriber (BOFU) would get a score of 30 – 50: they’ve made a purchase, and the higher the purchase value, the higher the score. From these tags, I know one subscriber found exactly what she was looking for: she consumed her free class, opened my welcome email and clicked a link in it to download her infographic, then became a trial member. From here, I’ll continue to nurture this buyer and tag her along the way: she gets a series on onboarding emails to help her find exactly what she gets in her membership, as well as weekly emails telling her what’s new in her classes. ActiveCampaign made it easy to take care of that new client from the moment she first visited my website and opted in to her moment of purchase and beyond. And tags let me follow her through that entire journey. The other subscriber didn’t make a purchase: she consumed the class, but hasn’t gone beyond that. I’ll be sending her additional emails this week, and my tags will tell me if she’s continuing to open and click on my emails. If so, I’m nurturing her further down the sales funnel. If not, after 60 days she’ll get a re-engagement sequence of emails based on the tags she gets after being inactive. Identify the tags that tell your subscribers’ story: what actions do they take demonstrating interest, commitment, and purchasing behavior? Those are the actions you want to identify with tags. Be judicious with your tags: a common mistake I see with my AC clients is they go crazy with tags, assigning too many. A key strategy of using AC wisely is knowing not to overcomplicate it: keep your lists, tags, and automations simple. Displaying your tags on the AC dashboard is my favorite step in this entire process, as it shows me exactly what I need to know about my subscribers at scale. I don’t have to peek into each subscriber’s individual record to see what they’re doing. Again, for this to work well, keep your tags limited to important behavior: too many tags and your dashboard will become a hot mess. The tag from that form triggers an AC automation to deliver the free class login details to their Inbox, along with several onboarding emails. So I assign a tag telling me they’re in that automation (preventing me from bombarding them with promotional emails at the same time). While you can assign tags in the Manage Tags area, I don’t recommend it. It’s too easy to add too many tags, forget you’ve done it, and have unused tags hanging around. It took me a long time to realize AC even had this feature, so I’m delighted to share it with you: Manage Tags. While that sounds like a standard way to create, edit and delete tags, it also offers my favorite way of using tags: to sort by my most popular tags. Before I knew AC offered this, I would export all of my contacts to a spreadsheet and do a complex COUNTIF formula to see which tags were most common among my contacts. This is one of the first steps I take when I review client’s AC accounts: reviewing their popular tags tells me what actions their contacts take in the greatest numbers, and where our easiest wins are. At this point, you’ve set up tags, have some automations running, and you should be seeing your tags displayed on your dashboard. Congratulations! First, evaluate what your most popular tags are (using the steps I outlined in the previous section). That tells you what your contacts are doing in the greatest numbers. Second, have those tagged contacts reached your goal for them? If not, find out where the bottleneck is in your funnel and continue your relationship with them with emails appropriate for their stage in the customer journey (TOFU, MOFU, BOFU). Third, what about the people who don’t have popular tags? What are they doing instead? Encourage them to move further along in your customer journey using a different approach: it could be an email series based on a page they visited on your website, or a re-engagement series if they haven’t opened your emails in a while. 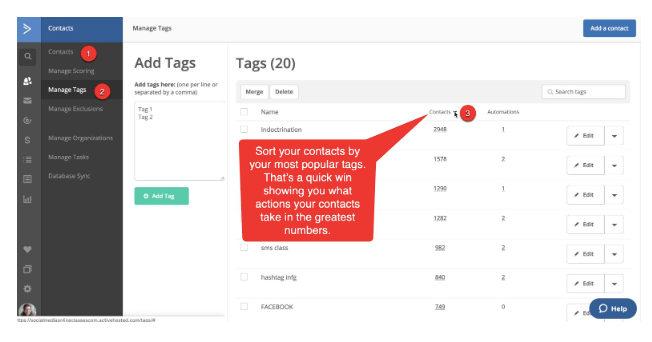 Use your tags to make educated decisions about how to continue your relationship with those contacts. When a contact purchases an introductory offer from me, I assign them a BUYER tag. What I wanted to know was this: what actions led those contacts to become buyers? While I could search AC for contacts with that tag, I really didn’t have a way of finding out what other popular tags BUYERS had. What actions did BUYERs take in greater numbers? Search your AC contacts for contacts with BUYER tag (substitute your tag here). Separate tags into columns by selecting Data>>Split Text to Columns in Google Sheets. 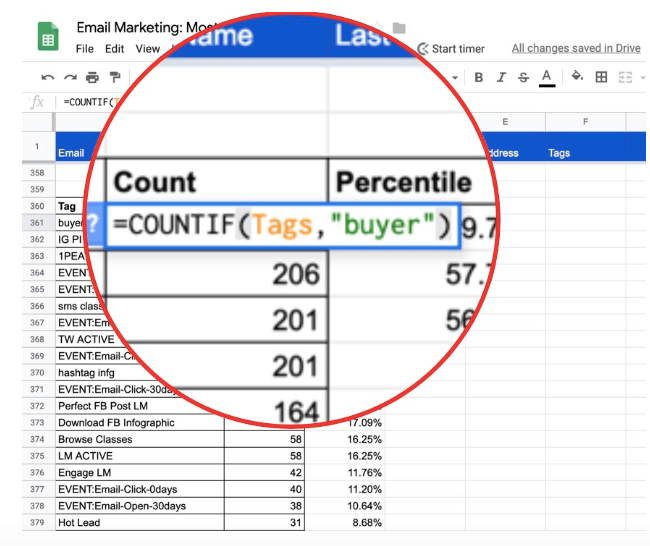 Create a COUNTIF table to identify which tags are most popular: these are the actions that lead subscribers to become buyers. Keeping my subscribers opening my emails leads them to become a customer. How did I know that? Because people who had had the BUYER tag also had a tag identifying them as opening an email in the past week. In fact, that OPEN tag was the most popular of all second to the original BUYER tag. My mantra now is, “keep them opening my emails”. People who opt in for my free Social Media Strategy class are more likely to become a full paying member. The SMS CLASS tag was the third most popular tag, behind OPEN and BUYER. 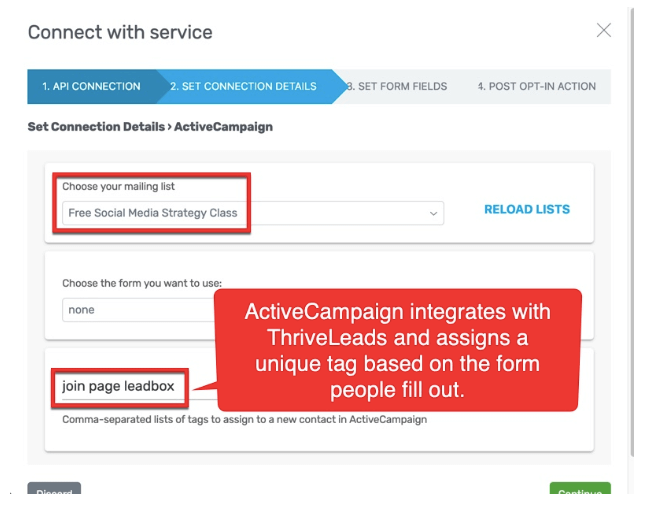 By exporting that list of BUYERS to a spreadsheet and identify their most popular tags, I identified the two most important actions my contacts take in their customer journey: opening my emails and joining my free Social Media Strategy class. None of that would have been possible without AC tags. Want a visual picture of where your contacts are in your customer journey? 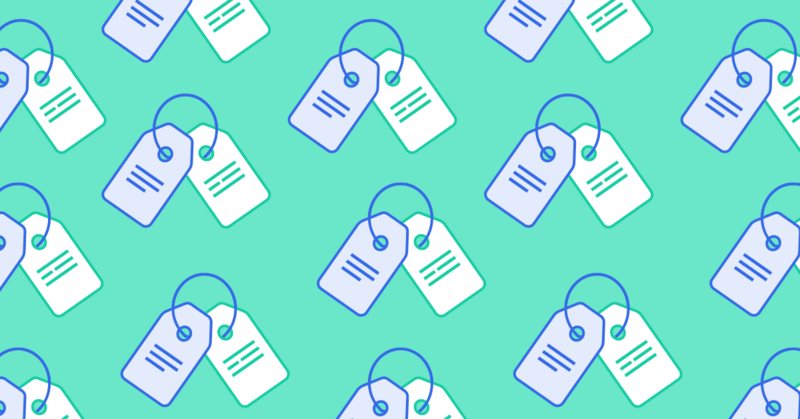 Use tags to identify the most important actions they take on the way to becoming a customer. 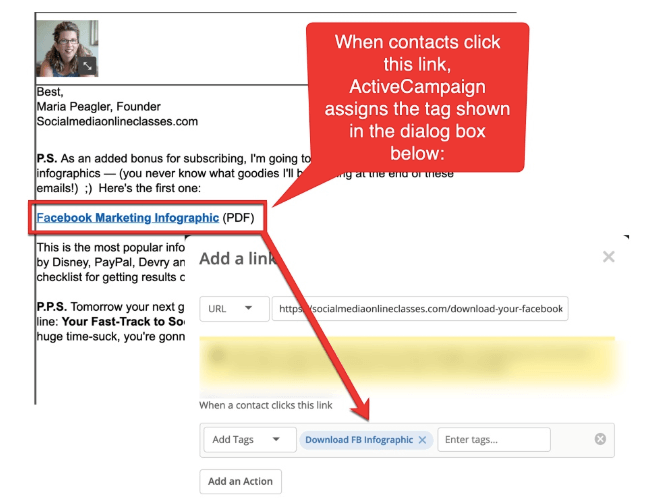 Then use those tags to nurture them throughout your sales funnel using ActiveCampaign. Maria Peagler is the founder of Socialmediaonlineclasses.com, an award-winning author & artist, and a certified ActiveCampaign consultant. Find her on Twitter at @sm_onlineclass.